INFORMATION:	A first-ever Academic Signing event will be held for students at St. Thomas More High School who will be attending UL Lafayette after graduation. The event is mirrored much like National Signing Day where athletes declare their intent to enroll at a particular university. 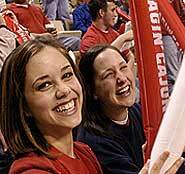 The event is designed to recognize students who have excelled academically by having them indicate their intent to enroll at UL Lafayette. Dr. Joseph Savoie, UL Lafayette president, along with STM officials will be present for the ceremony. Students will be called up individually to sign their certificate and will also be profiled by Dr. Savoie. More Academic Signings are planned in the coming months at various high schools. CONTACT:	Chip Jackson, director of Enrollment Services at 482-5687 or see him at the signing.